By staying calm, you may be able to satisfy even an upset customer. Even if you don’t, you can maintain your professionalism. One of the hardest things to teach people who are new to customer service is the art of staying calm when dealing with angry customers. While there’s nothing easy about having an irate person blame you for a problem you probably didn’t cause, dealing with difficult customers appropriately can save your company business and uphold your professional reputation. Here are my suggestions for keeping your cool when dealing with angry customers. Realize that, in all likelihood, the customer is not angry with you personally. Even if you did something to cause his or her anger (hopefully unintentionally), most difficult customers’ anger is not really personal in nature. They may be angry because their expectations weren’t met, because they feel they were wronged, or because of something personal and completely unrelated to you or the company you work for. 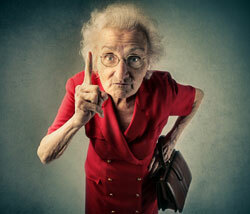 Make up your mind when dealing with difficult customers that you aren’t going to take their anger personally. It can be tempting when dealing with an angry customer to raise your tone of voice to match his or hers. Not only is this highly unprofessional and a poor reflection on the company you represent, but it will only escalate the situation. When you speak softly, the irate customer will need to quiet down in order to hear the answer to his demands. Even if you think the customer’s demands are crazy, chances are you have been angry yourself a time or two. When dealing with a difficult customer, you don’t have to agree with what they say to put yourself in their shoes and show some empathy for what they are feeling. This ties in with de-personalizing the clients’ anger. Remember that dealing with angry customers is important even if you aren’t able to satisfy the angry customers’ concerns. Other customers may be watching, and how you handle yourself reflects on you and the company you work for. Dealing with difficult customers appropriately goes a long way towards convincing others that you will also deal appropriately with their concerns. When all else fails, there’s no shame in handing off a difficult customer to someone else. Even if the person you are asking to help doesn’t have more authority, bringing a fresh face into a conflict can sometimes have a calming effect. This is especially helpful if the client is angry because of something you actually did. If you choose to do this, however, be prepared for the client to make angry comments about you, which may or may not be true, without defending yourself. If you have difficulty dealing with angry customers, don’t quit your job and assume you just aren’t cut out for dealing with the public. There are some simple skills which you can learn to help you when dealing with difficult customers. The five listed above are just a start. Bill Walsh has successfully developed/delivered over 2500 training engagements in the U.S., Canada & the U.K. He has appeared on radio, TV & has been quoted in Fortune Magazine & the Wall Street Journal.